Sony's VPL-VW85, a three-panel SXRD (LCoS) projector, is the successor to the brand's very well-received mid-price VW80, and, with a barnstorming performance both in our Tech Labs and on the test bench, it looks set to become a key figure in the home cinema market. Claimed performance improvements over the VW80 are a doubling in contrast to 120,000:1, (thanks in part to tweaks to the internal filters and light passage), and an improved Advanced Iris system, moving from Iris 2 to Iris 3. Iris 3 is meant to be more responsive to smaller areas of white in a dark background, and should improve tone across the colour range in low light conditions. MotionFlow technology is also featured, which creates intermediate frames from the original video source to double the number of images displayed per second. The idea is to create a smooth and seamless moving image. The VW85 features a selection of eleven gamma modes, tweaks to the colour presets and user parameters, and an anamorphic zoom mode. Features tailored to the customer installation market including a 12V trigger for electric screens, bundled gamma adjustment software, and a zoned panel alignment function. Finished in a swoonsome Midnight Sky Black with blue metallic flakes, the VW85 is a hefty beast, but so smoothly designed that it seems smaller. All the sockets and controls are arranged along one side, with a small hinged panel covering additional buttons for menu access, lens control and power. The lens is protected by a pair of automatic sliding doors. The menu system is clear and user-friendly, divided into pages for Picture, Advanced Picture (accessing the RCP colour adjustment parameters), Screen Modes, Setup, Function (including HDMI settings), Installation (including vertical keystoning, image flip and lens control), and, finally, System Information. The operating noise level is the same as the VW80 – 20dB. This is a boon, as there's nothing worse than a wheezing projector spoiling your fun. After firing up a selection of demo and movie Blu-ray discs, most notably the DTS test platter, my initial impressions of the performance were of stunning levels of detail; images were pin-sharp, and resolution so high I felt I could see every hair on actors' heads – achieved without any discernible sense of image processing. The black levels are everything Sony claims, too – in shots with a singer illuminated against a black background, the effect was of her floating in space; yet shots of a Japanese tea garden retained detail even in the darkest shadows. The projector also excelled with our static test card. Fine detail and texture were supremely handled, while red peppers popped with postbox vibrancy, and our 'Starman' trophy retained its golden lustre without tipping into yellow. Some might feel a need to tame the projector's wide colour gamut, but I was wowed by its realistic Technicolor-style presentation. In summary, the VPL-VW85 is hard to beat for the price. It's not a revolution compared to the VW80, but it is a good step forward. 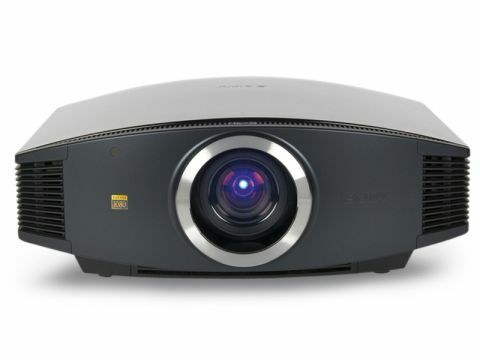 LCoS currently looks like the horse to back for projection systems, and so far, the VW85 is the race leader in this price category. How will JVC's forthcoming D-ILA models shape up?